"The Vagabondi puppet show is a very funny, clever and engaging way to get children and adults to start thinking about waste. A great way to start the Happy Bin project. I watched it six times and was totally entertained at every show." 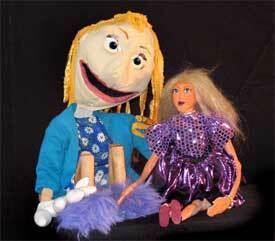 "I saw the puppet show at the school in Trefeglws, and it was brilliant." What's the Matter with Muriel Sbwriel? What is making Muriel the school dustbin so ill? Could it be something to do with the rubbish being fed to her? Intrepid school boy, Rhys, goes on a mission to find out. This show, which tackles the messy issue of waste management was designed to be the initial impetus for a 6 week series of lesson plans compiled by Green Egg. These lessons not only educate the schools but through the specially designed Happy Bin Website, enter them into a competition to see which school could reduce their waste the most. This show was commissioned by Ecodyfi (see Happy Bin) and received support from Glasu, Powys County Council, Welsh Assembly Government, and European LEADER+. It has been toured to schools throughout England and Wales with its last big tour being funded by Donarbon - a Cambridgeshire based recycling company. It is a bilingual show in Welsh and English. This show works best indoors. With halogen lighting provided by us, 2 mains supply sockets are required. We have our own PA system, the puppeteers operate the music themselves with a mini-disc player hidden behind the set, this mini disc player could be plugged into your PA system?